If youâre looking for a hot water unit with large volume capacity, look no further! 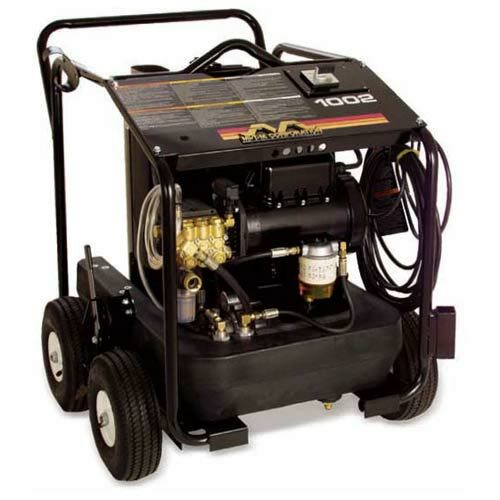 The Mi-T-MÂ® Hot Water Pressure Washer is the choice for you. The HSE Series works well in industrial applications that require 20 or more hours per week - this model is built for longevity. The top-fired heat exchanger is energy efficient and designed for convenient troubleshooting. The totally enclosed fan-cooled electric motor with manual thermal overload protection ensures your motor will run strong from start to finish. A 35 ft. power cord with in line GFCI, meets the required CSA certification. Not to mention, this pressure washer is quiet and works perfectly for those tough, industrial jobs.